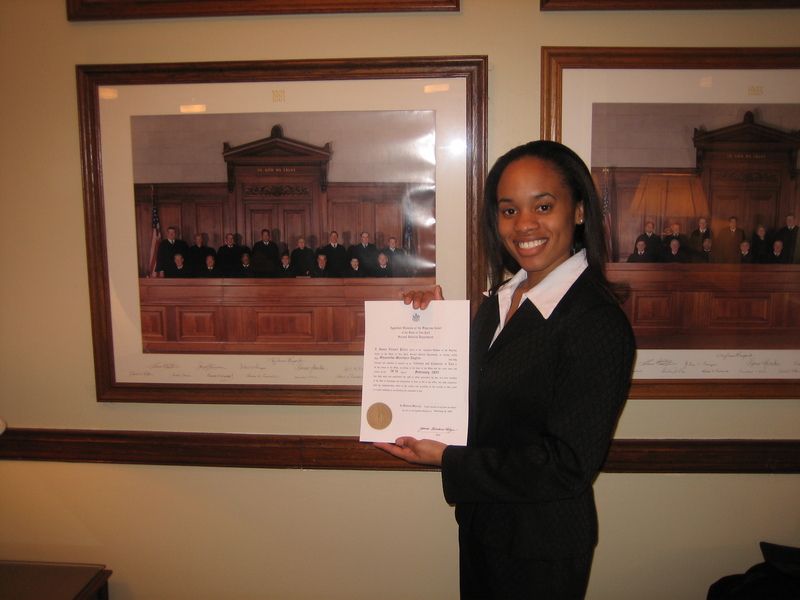 Successful Woman: Shameika Mathurin, Esq. Shameika Mathurin is an Assistant District Attorney and Prosecutor of the State of New York. She graduated and received a B.A. from Duke University in 2002, with a double-major in Political Science and African-American Studies. She received her J.D. from Brooklyn Law School in 2006. She spent most of her time in college trying to figure out what she was really interested in learning. She didn’t have a clue where a degree in African-American studies would get her, but what she discovered was that the history and culture of her ancestors and country was all that interested her at the time. Law school was a very different learning experience for her. She often jokes that the first time she ever really studied was in law school because understanding the different aspects of the law required a complete immersion in her studies. With that said, she did not completely immerse herself in her studies. What she found was that she immersed herself in everything. Extracurricular activities were always part of her story. In high school, she was the president of my student government, co-captain of three varsity sports and the anchor for her school’s morning news. In college, she was an executive board member of her school chapter of Delta Sigma Theta Sorority, Inc. and the local NAACP chapter and participated in numerous volunteer opportunities. In law school, it continued. She was the president of her school chapter of the Black Law Students Association, a member of the Moot Court Honor Society – where she competed and coached other teams, and volunteered as a mentor to high school students who competed in mock trials and appellate advocacy competitions. Throughout the years, she found that her extracurricular activities were what she enjoyed most in each academic phase of her life and never believed that she was taking on too much, but in retrospect will say that it may have overwhelmed her at times. We interviewed Shameika about her success and here are her answers. She takes us on her journey to becoming a lawyer and offers poignant advice as well. My mother. I’ll tell the story until I am no longer capable of telling it. My mother worked every day to bring home money to raise me, my twin sister and my two older brothers, and to support my aunt. She put me and my sister through private school and college on her income alone. Watching her do the math year in and year out on a pad of paper with a pen to see if she could make the tuition payments, pay the rent, buy food and keep all the utilities in service was humbling, but motivating. It still is to this day. At least as early as the second grade, I knew I wanted to be a lawyer. The problem was that my understanding of what a lawyer was and did was limited to Matlock and Clair Huxstable. Still, I was fortunate to have my family and other people at every stage of my life who encouraged me to follow through with it. Then, I had two professors in law school who took a personal interest in me and my possibilities. They took the time to get to know me outside of class and talk to me about combining my advocacy skills and comfort with public speaking. Then, one day, my professor told me, “you’re a prosecutor” and I took him up on it. Nearing graduation, I had alternate job offers, but had not started the interview process with my current job. I had to pass on those opportunities to see what would come of my interviews. Faith helped me make the decision to hold out; God’s grace brought me to where I am today. I handle setbacks with prayer. I have an unwavering belief that things will be as God means them to be and that they will happen on his time and not a moment sooner. So, when things aren’t going “my way,” I remain patient and faithful. Most recently, when my husband and I were trying to coordinate the sale of our co-op and the purchase of a home, the seller’s agent started getting pushy and wanted things done by a certain date. Then, our co-op board was seemingly attempting to block the sale of our place. Whenever it seemed like we were almost there, the bank would place new requirements on us for our purchase and closing dates kept getting pushed back. It was a very taxing situation, but I kept the faith and said if it was for us, then it would be ours. We closed exactly one month ago. I enjoy most believing in what I do. Prosecutors are in the unique position of being able to advocate for individual victims and society as a whole, which in some cases includes the defendant. The biggest misconception of our job is that we are simply here to put or keep people in jail. The reality is, I am here to seek the truth through the fact-finding process of our criminal justice system and, where it is warranted, hold people accountable for crimes committed against others. I am okay with that responsibility because my job is not to judge people; it is to evaluate their conduct under a standard that governs our society and is line with my personal beliefs. 5. How do you balance work life and family? Do your work demands affect your relationships? I balance my work life and family life by not trying to keep them completely separate. I work diligently during the day so that I can limit the amount of free overtime that I spend in the office. I also find that helping those closest to me understand what I do AND letting them know that I love what I do, makes work life and family life harmonious. My closest friends know that we may not talk for weeks or even months at a time, but when we get together its like we never missed a beat. My family has always been supportive and my husband is my biggest fan. God willing, in five to ten years, I will still be doing what I love and watching my own family grow. I am not sure if I will always be a prosecutor, but right now I can’t imagine doing anything else. I do aspire to become a member of the judiciary in this lifetime, but I’m content with taking it day by day. 8. Is there anything else you’d like to share about yourself? Personal testimonies are extremely helpful and well received. There was a time in my life when I accepted that people considered me to be an “exception;” I no longer subscribe to that mentality. I believe that my story is one that can be told by anyone who has the courage to follow their dreams and the faith to follow through with them. No matter the circumstance, I encourage everyone to pray the Serenity prayer (“God grant me the serenity to accept the things I cannot change; courage to change the things I can, and wisdom to know the difference…”) and, then, go become your dream. Sham, I’m so proud of you! You are fabulous and so humble. I’d love to sit in on one of court cases. I can see you now putting on your poker face when you knwo someone is trying to pull a fast one or straight lying—LOLOLOLOL!!!! Karen, I concur!!!! That’s my linesister and I’m proud of her.